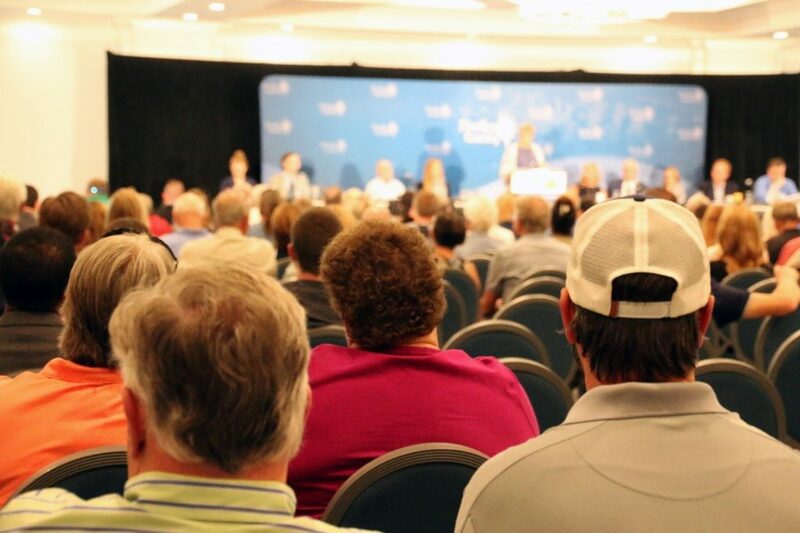 Professor Robert Weisberg (USFCMS) explains the link between ocean circulation and red tide blooms to a crowded room at the Sheraton Sand Key Resort during the Red Tide Summit. INDIAN ROCKS BEACH, FL – Harmful algal blooms (HABs), commonly known as red tides, are natural phenomena that have occurred in the Gulf of Mexico throughout human history. Last year’s red tide, which started in 2017, was a particularly epic incident that killed fish and other precious marine life, along with much tourism-driven business along the west Florida coast. 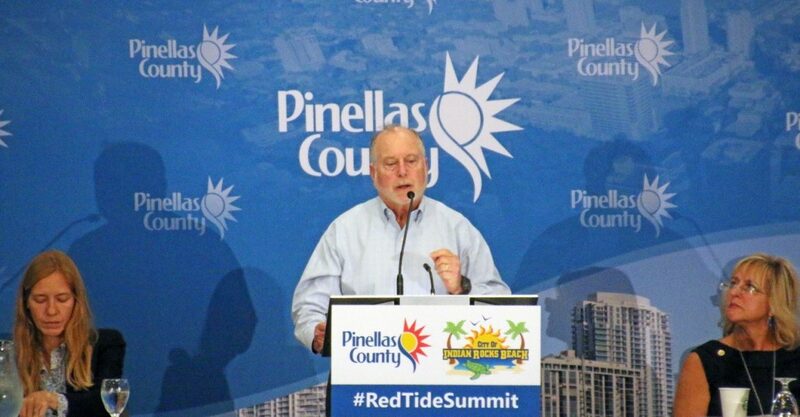 Weisberg explained that ocean circulation determines the location of a red tide. Hammer Levy recalled that when signs of the bloom came to bear, she called Weisberg, who warned that based on his models this was likely to be a “significant event.” Indeed it was. After reviewing the county’s impressive response to the spill, Hammer Levy asked the audience to commit to reducing nutrient pollution. 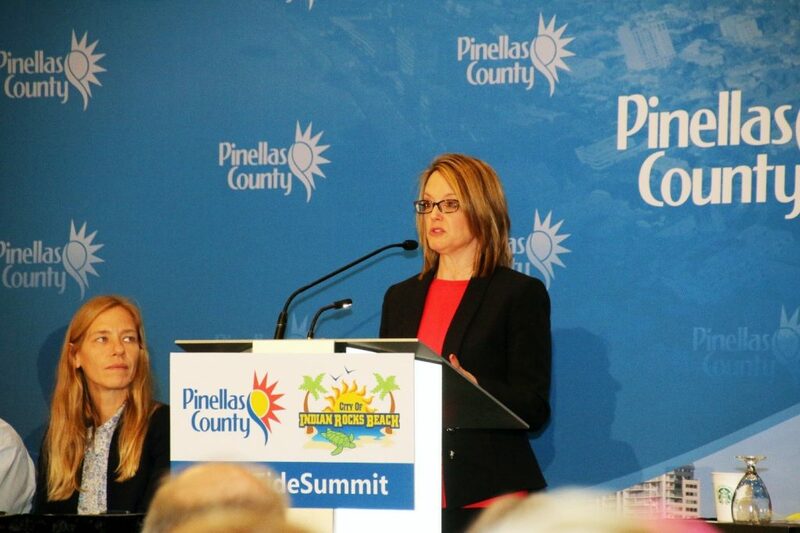 Kelli Hammer Levy, Division Director for Pinellas County Environmental Management and USFCMS alumna, summarizes the County response plan to red tide. Weisberg also emphasized the need to preserve modeling capabilities. Without continued funding for observation-based modeling programs, such as COMPS, the community would be left with limited methods to forecast the movements of a red tide bloom, and perhaps more importantly, no way to predict the likelihood and severity of red tide for the coming year – the kind of deep forecast that provides local and state government officials with the time needed to implement their response plans. The culprit is a marine dinoflagellate, a tiny floating plant called Karenia brevis, which is present in Gulf waters year-round. K. brevis blooms annually in larger concentrations, usually in late summer and fall. Many questions remain about the life history of K. brevis, such as exactly how a bloom starts and ends. Blooms of K. brevis originate offshore (usually 10-40 miles) in waters with low nutrient levels. When the K. brevis toxins become aerosolized by waves and wind, they can cause respiratory irritation for people. Using a handkerchief or mask usually resolves the problem, which is particularly problematic for those with asthma and other conditions. Through a collaboration between NOAA and the Gulf of Mexico Coastal Ocean Observing System (GCOOS), a respiratory forecast is available on the web, with an app for mobile devices in the pilot stage. The toxin can accumulate in shellfish and cause Neurotoxic Shellfish Poisoning if consumed. Only eat the fish fillet if caught during a red tide! Throw out the guts. Also, freezing and heating does not affect the toxin so do not eat any shellfish captured during a red tide. 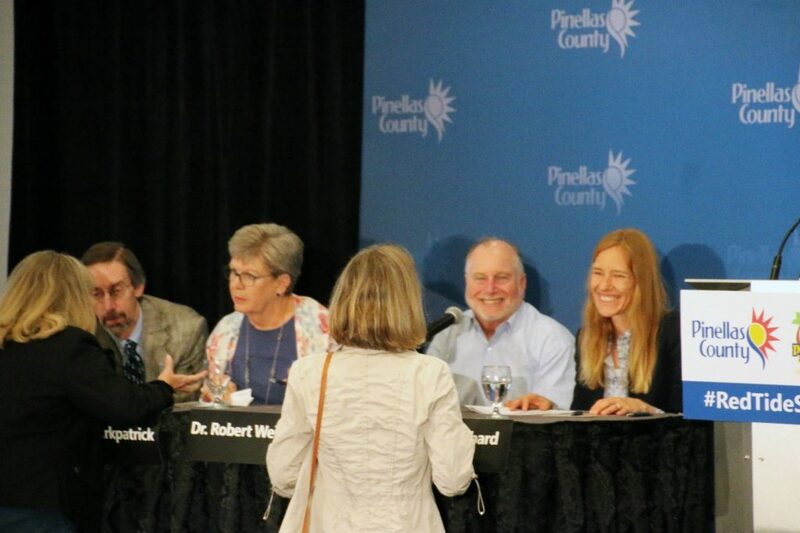 Panel scientists Dr. Richard Stumpf (NOAA), Dr. Barbara Kirkpatrick (GCOOS), Dr. Robert Weisberg (USFCMS), and Dr. Kate Hubbard (FWC FWRI) talk with audience members at the conclusion of the Red Tide Summit. A near-to-capacity crowd listens on as Dr. Barbara Kirkpatrick (GCOOS) explains biological and human health related aspects of red tide.